Skeptics, atheists, and modernists have waged an aggressive war against the Bible for over a century. They have succeeded in undermining public confidence in the authenticity of the text of the Bible, eroding the faith of young people by often claiming, "You can't be sure you have the Bible in its original form." "The Bible developed lots of errors and mistakes while it was being transmitted over the centuries." "The existing manuscript copies of the Bible all differ with each other and have thousands of variant wordings." So... How do we know the Bible was transmitted accurately? How much manuscript evidence do we have for the Bible? 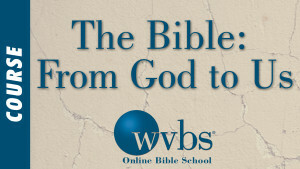 How can we be sure we have the Bible as God intended? How do we know how the original Bible read? Is Mark 16:9-20 supposed to be in the Bible? Join Dr. Dave Miller in this nine-session program as he provides easy-to-understand answers to these technical questions. 1. Introduction | Has the Bible Been Corrupted? Has the Bible been corrupted? 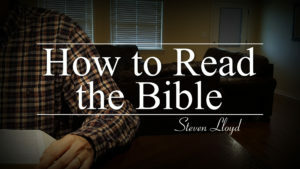 Can we be sure the Bible is God's word? Skeptics, atheists, and other religions have aggressively attacked the Bible for centuries. How do their arguments fair against the historical and documented history? Join Dave Miller, Ph.D., in this first part of a nine-session series, where he provides easy-to-understand answers to these important questions. 2. Unintentional Errors | Has the Bible Been Corrupted? During the first few centuries after Jesus' death the Bible was transmitted through copies of the original letters. Since persecution was intense against Christianity, any copies would have been produced by individual members. Later centuries saw larger standardized methods for producing copies to distribute. What types of unintentional errors could occur and how widespread or complete would these errors be? Join Dr. Dave Miller as he discusses the historical context and the manuscript evidence for unintentional errors. 3. Intentional Errors | Has the Bible Been Corrupted? As copies of the Bible were being made, sometimes the scribes or monks who were transcribing the texts introduced intentional changes. These were not a miscreant act to alter the text, but what a scribe may have felt needed to be changed, such as what he thought might have been a misspelled word. 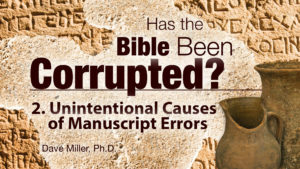 In this lesson, Dave Miller, Ph.D., discusses these different types of intentional errors and if they affected the message of Bible. 4. Weighing Textual Variants (Part 1) | Has the Bible Been Corrupted? How do scholars distinguish between textual variants, and what criteria is used to sort out differences? The vast majority of manuscript variations involve minor matters, and do not affect doctrine relating to one's salvation. Join Dave Miller, Ph.D., as he discusses the process of evaluating the significance and origin of textual variants. 5. Weighing Textual Variants (Part 2) | Has the Bible Been Corrupted? One of the best ways to be assured of the Bible's integrity, is to see the process for how manuscripts variants are resolved. Join Dave Miller, Ph.D., as he uses specific verse examples to illustrate the resolution in each case. 6. Weighing Textual Variants (Part 3) | Has the Bible Been Corrupted? Has the Bible been corrupted? As we explore this question, Dave Miller, Ph.D., has explained the process for evaluating specific manuscript variants. Seeing the resolution illustrates the Bible's integrity. 7. Weighing Textual Variants (Part 4) | Has the Bible Been Corrupted? In evaluating textual variants, we have seen how the variants affect very little the doctrinal teachings of the Bible. In this last segment covering textual variants, Dave Miller, Ph.D., addresses the most prominent textual variant in the New Testament from Mark 16:9-20. Follow along as Dr. Miller applies the principles of textual criticism and weighs the important considerations for these verses. 8. The Translation Process Works | Has the Bible Been Corrupted? 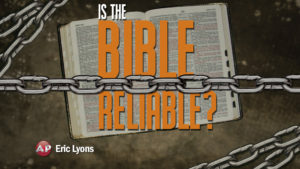 How do we know the Bible was preserved accurately? First, we have seen that the Greek text has been authenticated and textual variants are minimal. In this segment, join Dave Miller, Ph.D., as he discusses the translation process and how it corroborates the accuracy of the original text. 9. Translation Differences Are Decipherable | Has the Bible Been Corrupted? Has the Bible been corrupted in its transmission? Can we know that we have the New Testament that God intended us to have? Join Dave Miller, Ph.D., as he answers these questions and demonstrates that the Bible text we have today is trustworthy. 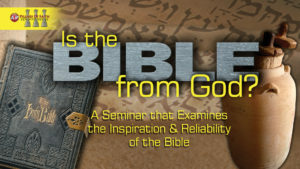 Dr. Miller addresses a third proof for the Bible's preservation from the translation processes.